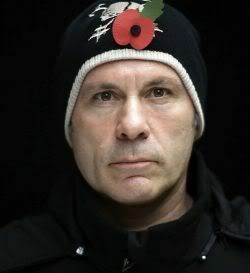 IRON MAIDEN singer Bruce Dickinson was recently invited to take part in a unique project instigated by the Royal British Legion for its official charity single "2 Minutes Silence". The single features noiseless contributions from representatives of our society, including some very famous faces, harnessing the sound of silence in a bid to raise much-needed funds exclusively for the Royal British Legion, a registered charity which supports serving and ex-serving members of the armed forces community who need assistance. 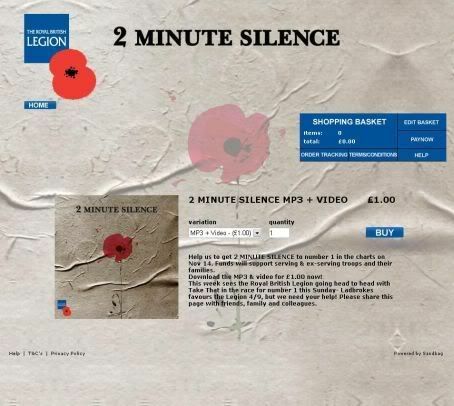 The single takes the form of a silent video with participants shown in quiet reflection and will be on sale from November 7 and the Legion hopes to get it to number one for Remembrance Sunday (November 14), the day Britain pays tribute to members of the armed forces community who have made sacrifices, including today's Afghan generation. It can be downloaded from iTunes on November 7, costing 99p. The concept behind the single being silent is that the Legion felt that the British public would recognize the poignancy of silence and its clear association with remembrance and Remembrance Sunday in particular, or "Poppy Day," as it is often called. Says Bruce: "When I first heard about the concept of the '2 Minutes Silence' single, my first thought was it was the work of a madman... my second thought was, no — it's the work of a genius! Many people have forgotten what Remembrance Sunday is really about. Hopefully this will serve to create more awareness of this and of those who risk paying the ultimate sacrifice. It's an honor to be involved with this project"
Among others who appear in the video are: Prime Minister David Cameron, the actors David Tennant and Bob Hoskins, Thom Yorke from RADIOHEAD, Bryan Ferry, Alex James, Mark Ronson, tennis star Andy Murray, rugby legend Martin Johnson, comedians Paul O'Grady, Jimmy Carr, Jack Dee and services personnel, including Paul McClintock and Simon Brown, Lance Corporal Ram Patten and Captain Rupert Stevens. The Royal British Legion is the nation's leading armed forces charity and is best known for the annual Poppy Appeal. For more information and details of how to download the single, join the official Facebook group.